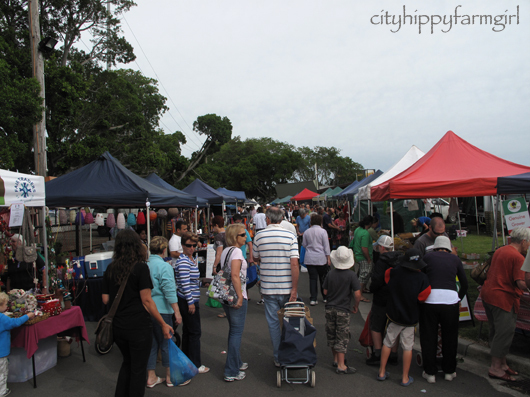 This entry was posted in Connecting with Community, Food Glorious Food and tagged farmers markets, local food, Newcastle, weekend by cityhippyfarmgirl. Bookmark the permalink. And you had sunshine! Looks like the perfect weekend away. Now that sounds like a cracking weeking weekend too. Any day that starts off with yoga has got to be a good one. I like Newcastle. My two girls are at Newcastle Uni and share, with three others, a terrace in Waratah. It’s a nice laid back small city, the coffee nazi in me seems to be able to sniff out a decent long black most times, the markets are good and the scenery great. Hey nothing wrong with being a coffee nazi Bob, I completely understand. A good brew is very important! I had my first visit to Marrickville Markets and the obligatory long run! I haven’t been to Marrickville markets for a long time. What did you think? Joanna you would love it there. 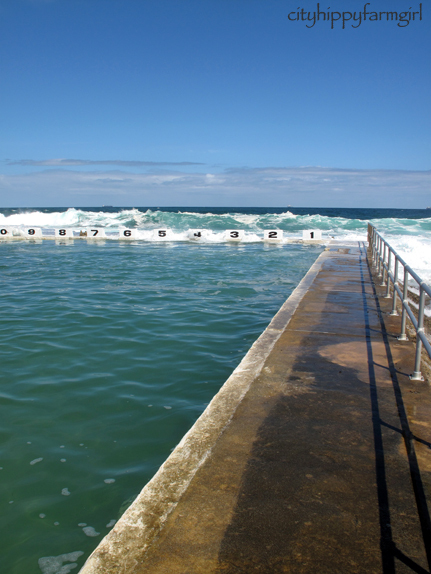 Those sea pools are wonderful, everything was looking so very blue when we were there. Aww, lovely photos! I worked on Saturday, and today we were getting the house & stuff ready for going away! Boring stuff! Ahh yes, but going away is never boring! Happy travels Ms Dixiebelle. 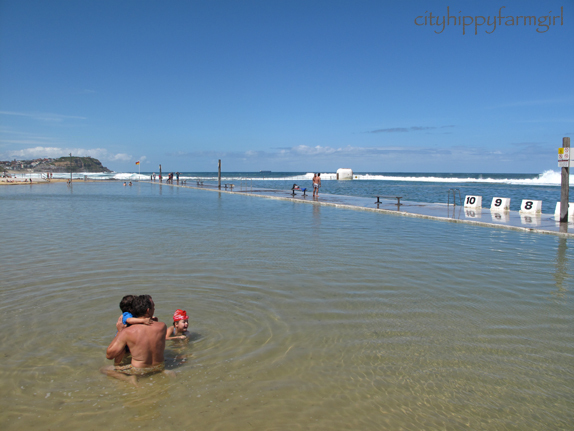 Great photos of the ocean pool. Good to see you got some sunshine. Thanks HS. The sunshine was much enjoyed. Grey again today. Looks fantastic 🙂 We had Little Bits Bday and the last of the Xmas shopping and wrapping…all good to go! SNOW…Lots of it…at least the chickens liked it…I would have loved to spend mine at the beach or farmer’s market. Snow! We could swap for a day? those blue skies look perfect – our weather seems to have gone from stinking hot to gloomy grey – but we have been inside mostly decorating christmas trees and going to parties – looking forward to a sleep now! We have had lots of grey as well, (today included). Hope you got a good sleep Johanna. 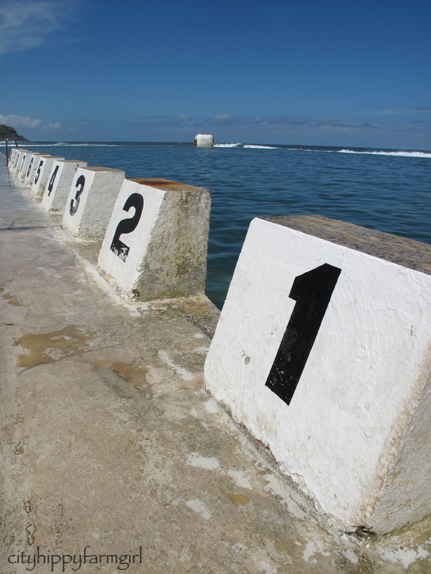 Gorgeous blues… those numbered blocks are for swimming races?? I’d give anything to have been there! We had a warm week, but the cold is back and I’m looking at snow falling outside… shivery! I’ll take sea pools any day! Lovely guests with beautiful little children to charm,winning gingerbread contests, leisurely breakfasts with loved ones, and one last shopping trip for Christmas toys for grandsons! All very happy and much enjoyed- our trip out to the beach included cold temps and brisk breezes- yours looks much more inviting! Sounds like a perfect weekend Heidi! what a happy post brydie..and i love the old concrete starting blocks..
Looks like a beautiful weekend 🙂 Mine was a little lower key, but did involve the family catch up and lots of associated giggles. A weekend in Lorne celebrating my dad’s birthday. your trip to Newcastle look & sounds fab. Wonderful photos that remind me that there’s relief coming in a few months. I’m sitting here glaring at several millimetres of ice accumulation on my plants. It’s cold here. Really cold. At 7am it was only -2C. Brrr! A happy, happy weekend! Bluebottles…not the monkeys? Or you? Eek! I’ve never been in the path of one..
We’ve been working our way down the arm length list of jobs to do before Christmas. Good that the house gets an overhaul..but oh, SO exhausting! Unfortunately Monkey Boy’s foot found one. Tears, and then some much needed dad cuddles. They hurt! Sounds and looks like a perfect weekend…you can’t beat being at the ocean in my book!